The weather has been completely crazy here in the Northeast. I don’t think we’ve had this much snow in one season since I was a kid! Alas, I no longer get the pleasure of snow days when the sky decides to dump a foot of the white stuff on us, but I do get to decide what tasty dish the Quantum Vegan household will be having for dinner. My mom loves pasta. I do, too, but there’s something about a big plate of noodles topped with tomato sauce that strikes me as less than adventurous. Enjoyable, yes, but not adventurous. However, pasta is definitely a part of my continuing love affair with noodles of all kinds and, like all noodles, it’s extremely versatile. That makes it the perfect candidate for inventing new recipes! Yesterday I knew I wanted a pasta bake of some kind, but I also wanted roasted veggies. So I put both together and came up with this. It’s easy to make, it’s warming, and roasting the veggies gives it a particularly nice flavor. 1) Preheat the oven to 425°F. While it’s heating, cook the pasta according to package directions until firm. Drain and set aside. 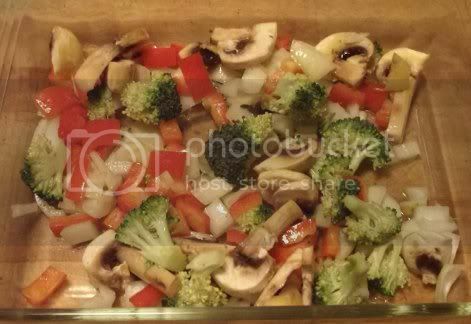 2) Combine the chopped veggies and olive oil in a small casserole dish, stirring to coat. Roast for 20 minutes, stirring once, until the veggies are tender and just beginning to brown. 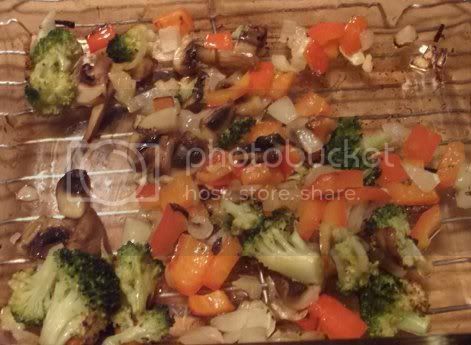 3) Remove the veggies from the oven and reduce the temperature to 350°F. Add the garlic, pasta, and sauce to the pan and stir until well combined. Top with the shredded mozzarella. 4) Cover with foil and bake for 30 minutes. 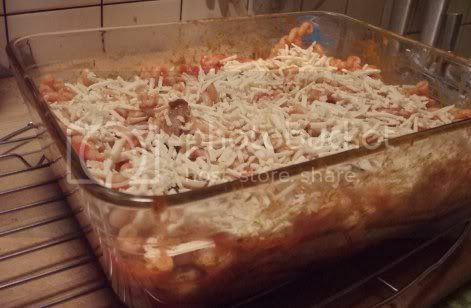 Remove the foil and bake 10 minutes more, until the edges are browning and the cheese is melted. Serve hot.